Hike might’ve just played its biggest hand in trying to compete with Whatsapp in India. The company has launched its own Wallet, through which users can transfer money and make recharges. The wallet option pops up as a separate tab on the Hike app, and lets users to access their contact list as they’re sending money. 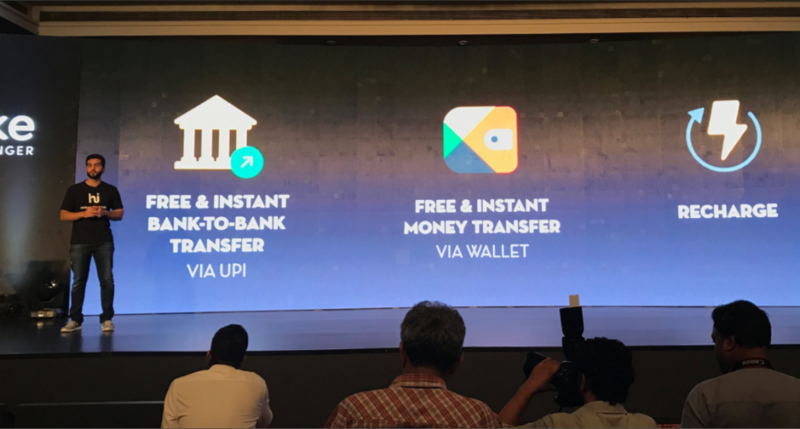 The wallet lets users send money either to a contact’s linked UPI account, or to their Hike wallet. All transfers are free and instant, the company says. This is pretty neat — this is a functionality that Whatsapp, India’s most popular messaging app, doesn’t currently have. While Whatspp is extensively used for commerce-driven conversations, users still need to revert to a dedicated wallet, such as Paytm, or bank-to-bank NEFT transfers to exchange money. Having inbuilt capabilities to transfer money could be instrumental in developing Hike as a payments platform. And Hike has the basics in place to become a large payments play. While there is no dearth of wallet options in India, with new wallets being announced nearly every week, Hike’s wallet will have an enviable user-base as it starts its operations. Hike had touched 100 million users last year, and they will provide the initial impetus required for its wallet to gain popularity. It helps that Hike is primarily a messenger, and as such an app people that like to keep on their phones — if it can perform money transfers as well, it could well obviate the need to have a separate wallet app, such as Paytm or Mobikwik. But Hike will likely have its largest competitor breathing down its neck. Whatsapp has already announced it will be launching peer-to-peer payments in India soon, and its CEO Brian Acton had even visited India to discuss integrations with UPI. Hike might have a lot of users, but its ubiquity pales in comparison to Whatspp. If Whatsapp can launch its own payments functionality over the next few months, it could quickly neutralize any advantage that Hike gains over the period. And historically, Hike has found it hard to compete with Whatsapp. Hike had launched video and audio calls before Whatsapp, but had failed to make much of dent to its userbase. Whatsapp enjoys a first mover advantage that resulted in its large, dedicated user-base, and Hike is now in the unenviable position of trying to convince those users to move to its platform instead. Adding payments functionality is certainly a step in the right direction, but one wonders if it’ll be enough.